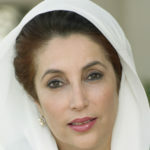 Ideologically a liberal and a secularist, she chaired or co-chaired the center-left Pakistan Peoples Party (PPP) from the early 1980’s until her assassination. Bhutto was born in Karachi to a politically important, aristocratic family; her father, the PPP’s founder and leader Zulfikar, was elected Prime Minister on a socialist platform in 1973. Bhutto studied at Harvard University and the University of Oxford, where she was President of the Oxford Union. "The government I led gave ordinary people peace, security, dignity, and opportunity to progress." "Military hardliners called me a ‘security threat’ for promoting peace in South Asia and for supporting a broad-based government in Afghanistan." "General Musharraf needs my participation to give credibility to the electoral process, as well as to respect the fundamental right of all those who wish to vote for me." "The next few months are critical to Pakistan’s future direction as a democratic state committed to promoting peace, fighting terrorism and working for social justice." "Democracy is necessary to peace and to undermining the forces of terrorism."